Fatah, the ruling political party of the Palestinian Authority (PA), continues to incite violence against Israel on its Facebook page. 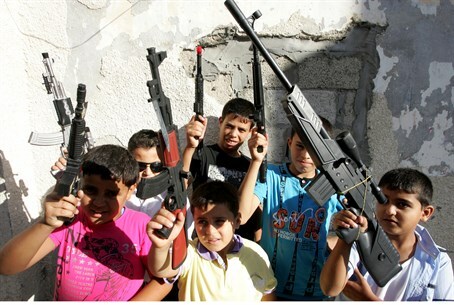 According to Palestinian Media Watch (PMW), a prominent post reads, "Teach your children to love the soil. Teach them that we live in misery. Teach them that there is a seed in the soil; if you water it with blood, it will sprout a revolution." The statement is accompanied by an armed and uniformed man standing over a large crowd with a rifle, under the PA flag. Fatah's Facebook page has been a hotspot for incitement. Last week, the page praised a mass murdering terrorist, in a post celebrating the anniversary of terrorist Ali Ja'ara's Jerusalem bus suicide bombing attack that killed 11 in 2004. Ja'ara was honored on PA TV in 2012 when his body was handed over by Israel in a "goodwill gesture." The post called Ja'ara a "quiet hero" who "succeeded in breaking the Zionists' security barriers and breaching their fortresses." The group also praised several other terrorists, including Wafa Idris, the first female suicide bomber who killed 1 and injured over 100 in downtown Jerusalem in 2002, calling her "a Palestinian who knows the way." Idris was able to get through Israeli security in a PA ambulance as a volunteer for the Palestinian Red Crescent. Idris is "the sun of Palestine and its shining beacon" according the party of Israel's "peace partner" Abbas. Her terror attack was lauded by Fatah as "heroic" and "an object of pride, honor and admiration." The murderer was praised as being "sharp as a sword and strong as an oak tree." Another post featured a photo of the terrorist Mohammed Mubarak, who earlier this month opened fire on an IDF post near the Samaria community of Ateret, close to Ramallah. Mubarak was eliminated by the IDF soldiers who returned fire, but not eliminated from the Fatah page where he was praised as a "heroic martyr." A picture of Mubarak superimposed on that of former PA Chairman Yasser Arafat features the text "on couches, facing one another, with Allah on a magnificent throne," a paraphrase of verses from Quran Sura 56 describing Heaven. PA incitement against Israel continues to escalate, prompting intense efforts to assess the scope of the incitement and bring it to international attention. Last month, Intelligence Minister Yuval Steinitz presented a detailed report on the incitement. Findings included an analysis of how statements against Jews and Israel are being distributed and what is being said; a clear link was shown between the incitement and ongoing peace talks. "We must not ignore the fact that the Palestinian educational system and media, under the patronage of Abbas and during the negotiations, are educating and inciting – on a daily basis – for the destruction of the State of Israel," Steinitz stated at the time.